This new pumpkin guy is the best! He is 25" long and he is wearing a small brown check shirt with osnaburg pants with straps. A black crow sits on his shoulder. Wonderful piece for Harvest time. 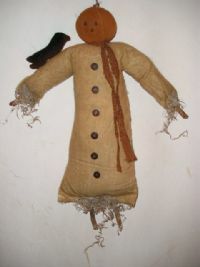 This hanging 17" muslin ghost will surely bring in the halloween spirit to your home. 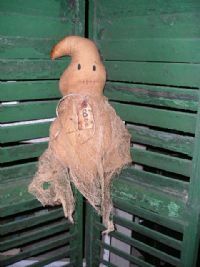 He has grungy cheesecloth hanging from his body with a tag around his neck that reads "BOO". 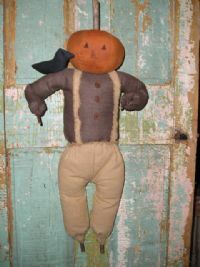 Pumpkin Peter is new to our line and he is a favorite. He is weighed to stand at 16" including his stem. 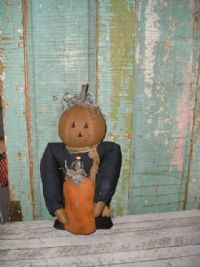 He is holding an orange pumpkin in his arms. This is a must have for Fall. 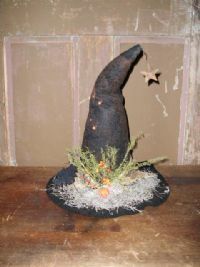 14" Black witch hat with moss, rusty star and bells, berries and sweet annie make this a wonderful center piece. Hat is then brushed with cinnamon for a great prim look.